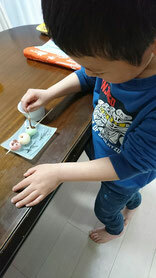 We love to eat ``Hanami Dango`` in March and April, Hanami means cherry blossams viewing party, Dango means ricecake dumpling. 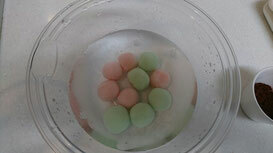 I would like to share the recipe of Hanami Dango. Each color express spring, the pink is cherry blossams or the sun the white is amazake(fermented rice drink) the green is spring grass Yomogi. 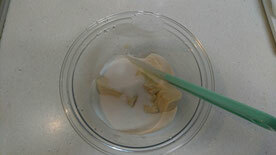 (1)Mix shiratamako, tofu and sugar. (2)Knead it till it becomes hard as an earlobe. (4)Add red food coloring on a dough and mix well doing the same thing another dough to be green and leave the last dough white. 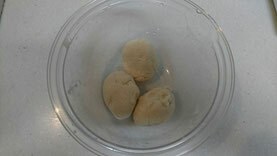 (5)Make small balls from each dough. (6)Boil each color dumplings at a time. 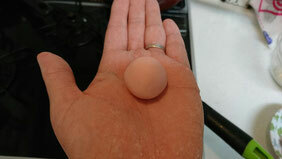 Once they float in the boiling water, cook 2-3 minutes longer. 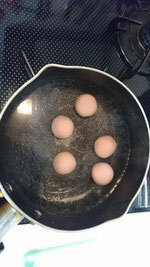 (7)Take out from hot water, put them in a cold water. 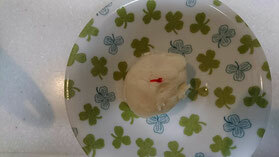 (8)Dry the dango dumpling with kitchen towel. 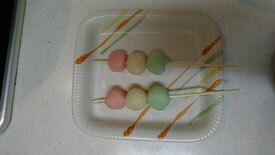 (9)Skewer three colors dumpling the bottom is green the middle is white and the top is pink. 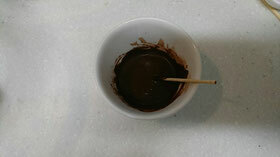 (10)Mix cocoa powder and a little water like colorpaints. (11)Draw something on the dango dumpling.